Shaping the "Classic American Desert"
Despite its archetypal status, the Mojave does not really fit the classic image of a desert. 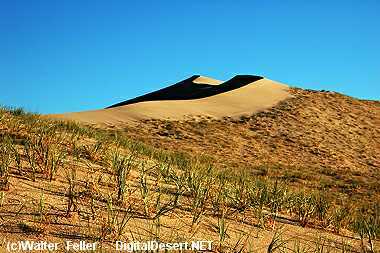 For example, it contains sand dunes only in limited areas, and is characterized by parched mountains that rise abruptly from alternating plains, or basins. 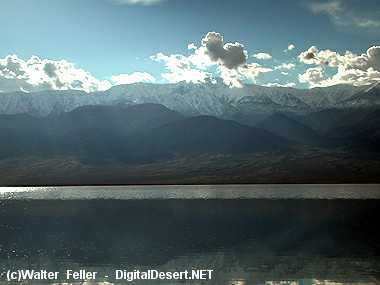 The area of most dramatic relief is around Death Valley, California, where the elevation drops from 3,400 m above sea level at Telescope Peak to 88 m below sea level at Badwater--a surface distance of only 23 km. The Mojave's mountains are in fact burying themselves in their own debris as storm-driven rocks and boulders pour from canyons, spreading out to build gigantic alluvial fans. Where several deposits join, they form bajadas, long, sedimentary slopes sprinkled with cacti and creosote bush. Bajadas are capped with desert pavement, composed of gravel and small rocks, overlaid with delicate desert varnish--thin clay and other particles cemented to rock surfaces by manganese and iron that have been oxidized by bacteria over thousands of years. The large expanses of the Mojave's bajadas make them the dominant geomorphologic feature of the Mojave Desert ecosystem. Since basins have no outlets, when rainfall collects and evaporates, it leaves behind flat alkaline deposits on which almost nothing will grow. The white surfaces of these playas, or dry lakes, are startling against the duller, brown back-ground. Playas, such as Soda Lake at the end of the Mojave River in California, are among the flattest landforms in the world. 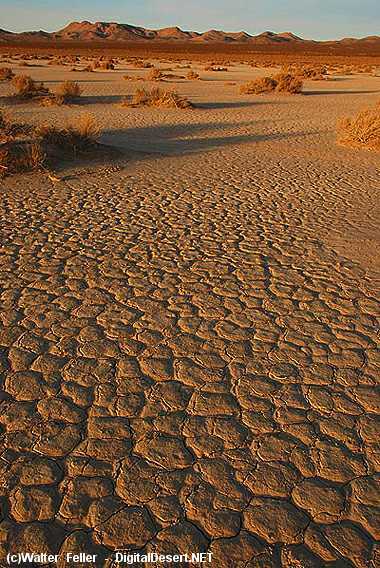 Dry riverbeds, or arroyos, are also present in the Mojave, as are volcanic remnants. The Mojave Desert is a subsection of the Basin and Range Physiographic Province, which is characterized by long, north-south-trending mountain ranges separated by broad valleys. Igneous, metamorphic, and sedimentary rocks of the Mojave Desert reveal prehistoric landscapes as old as 2.7 billion years--over half the age of the Earth. 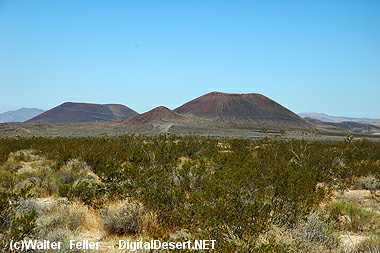 During the Paleozoic era the Mojave Desert was covered by shallow seas, as evidenced by fossil marine creatures in limestone and dolomite. These fluctuating seas deposited thousands of meters of sediment that can be seen in banded mountains throughout the Mojave. Limestone has played an important role in the history of the Mojave as a host rock for metallic mineral veins, which were produced when magma intruded. During the Mesozoic era the Mojave region was uplifted. Salt-laden water bodies evaporated, leaving behind puffy crusts of evaporite minerals, such as halite and gypsum. Rivers and ephemeral streams carried large amounts of eroded materials into the lowlands. The Mojave's climate became even more arid and windy than it is today, causing the formation of belts of sand dunes and creating the cross-bedding patterns that are visible in the colorful sandstone of Nevada's Red Rock Canyon and elsewhere. At the beginning of the Cenozoic era tectonic activity resumed. Movement along faults deformed the Mojave's layers of sediment and underlying metamorphic rock. Shifts along thrust faults forced older layers on top of younger ones, as can be seen at Red Rock Canyon National Conservation Area. Faulting was accompanied by an increase in volcanic activity. At present-day Death Valley, these processes pushed up mountains and caused the valley floor to drop, forming a below-sea-level trough. Hot springs near Nevada's Lake Mead and cinder cones and lava flows in the eastern Mojave are reminders of this active period. About 17.8 million years ago, a powerful volcanic eruption in the Woods Mountains dispersed a low cloud of ash and rock fragments across the countryside, burying shallow lakes and stands of trees. The fossils of ancient life forms are preserved in sediments below this ash layer. The Mojave is a geological "accommodation zone" between the surrounding Pacific and North American plates, which causes the region to experience relatively strong earthquake activity along numerous faults. For example, a 7.6 magnitude earthquake in the western Mojave shook a wide area in June 1992--the largest quake to strike California in 40 years. In October 1999, a 7.1 magnitude earthquake jolted Barstow, California, and surrounding areas. Twenty-five aftershocks of magnitude 4.0 or greater occurred within 36 hours of the main shock.